Available in hardcover, paperback and as an eBook. 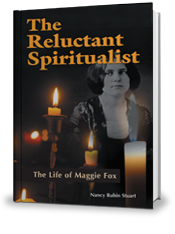 Here is the first authoritative biography of Maggie Fox, the world-famous medium and cofounder of the Spiritualism movement that swept America in the mid-1800s. In 1848 fifteen-year old Maggie and her sister Katy created rapping sounds in an upstate New York farmhouse by manipulating their toe joints, practicing until they convinced their superstitious mother their farmhouse was haunted. News spread quickly to nearby Rochester and then to New York City where newspapers publicized the girls’ ability to communicate with spirits. Before long, Maggie, Katy and a third sister became international celebrities. By 1853 more than thirty thousand mediums were at work with Maggie among the most famous. Soon afterwards she was courted by dashing Arctic explorer, Elisha Kent Kane, who wed her in a secret ceremony. In 1888 after Maggie denounced the faith at the New York Academy of Music, Spiritualism withered almost as quickly as it had bloomed. Through the memoirs of the Fox sisters, the letters of Maggie’s explorer husband, contemporary newspaper accounts and other primary sources, Nancy Rubin Stuart creates a vibrant portrait of a Victorian-era woman confounded by love, family ties and the conflict between science and faith. The Reluctant Spiritualist is a story you’ll never forget.